Adelaide Strikers set up a Big Bash League final against Hobart Hurricanes, edging past Melbourne Renegades by one run in their home semi-final. 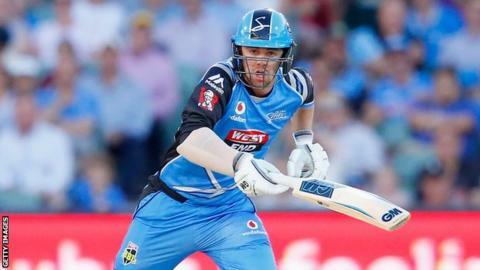 Travis Head, released from Australia's Twenty20 tri-series squad to play in the game, hit an unbeaten 85 from 57 balls, adding 104 with Jake Weatherald (57) in the Strikers' 178-5. Marcus Harris (45) kept the Renegades in touch but they needed 13 off the last over and seamer Ben Laughlin held his nerve against Tom Cooper (36 not out) and Kieron Pollard (29 not out). Adelaide Oval will now host Sunday's two finals. Earlier at the same venue, the Strikers lost their Women's Big Bash League semi-final to holders Sydney Sixers, despite a half-century from England's Tammy Beaumont. You can listen to commentary on the men's and women's Big Bash finals on BBC Radio 5 live sports extra, the BBC Sport website and app.